UPDATE 7-16-14: An additional section has been added near the end covering the Islamic Crescents’ Observation Project visibility map. As the reported sighting came in from Yemen on Friday June 27, 2014, one of my friends remarked, “that Yemeni must have been high.” I laughed, not only because Yemenis are known to chew a semi-intoxicating substance called ‘khat’, but because I had seen four different [amateur] astronomers produce visibility calculation maps, such as the two below, and all of them were clear that it was impossible to sight the moon in that part of the world. Several hours later, I managed to tap in to a live-feed of a long and heated discussion taking place among the Assembly of Muslim Jurists of America [AMJA]. They were deciding whether or not to reject the Yemeni sightings based on astronomical visibility calculations claiming it impossible to sight the moon there. As the discussion drew to a close, news came in that the crescent was sighted in Houston by three people and another one in Alabama. Initially I wondered if they were chewing some of that Yemeni ‘khat’ as well. To my surprise, within a matter of minutes, AMJA made the call to confirm both the Yemeni and American sightings. Nonetheless, many prominent scholars rejected these reports outright based on the colorful visibility maps they had seen, even those living in the Houston area. I didn’t know what to think and chose to defer to the senior scholars. “Let them take the burden on themselves”, I said internally. Later that night, two more reports came in, one from Tucson and another from San Diego. They were also rejected by the same scholars for the same reasons: those locations are not within the visibility zones on the maps. I know for a fact that people do make mistakes in seeing the crescent [even if they aren’t high], but what if one of these sightings happened to be in the gray area that Dr. Ahmad was alluding to and the calculations used to make these maps were off? I decided to investigate. Despite Mateen’s detailed story, many still rejected his sighting because San Diego does not fall on the visibility maps that have been produced. I called Dr. Salama again, giving him all of the details of the sighting he asked for: degrees the moon was from the sun, the horizon to the crescent elevation, etc. After a few days he phoned me back telling me that in his expert opinion as an astronomer, this sighting cannot be rejected based on the elevation of the viewer, sunset and moonset timing, etc. These maps are not deterministic in nature but should be used as a guide to know where the moon can ‘usually’ be sighted. The only thing that is deterministic is the position of the moon relative to the sun, the earth, etc. These maps are calculated based on sighting reports from amateur astronomers who reported whether or not they saw the moon on certain days. However, there are three issues. One, those sightings [or lack thereof] were viewed under certain physical conditions which will be different based on the condition of the sky and atmosphere on another future date. Two, the sightings are not taken from observatories or expert astronomers but rather amateur enthusiasts. Three, the number of observations is limited. If the data points were doubled or tripled, it is probable that the visibility curves would change drastically. In conclusion, the early visibility of the moon has always been a problem due to how the Earth’s atmosphere distorts light and due to other environmental factors. Even the U.S. Naval Observatory is on record to admit that there is a large ‘gray area’ when it comes to commenting on the visibility of the moon in any given place at any given time. Another interesting find was a new map which adds a zone of impossibility. Strangely, there are two wordings: ‘not possible’ and ‘impossible’. The red zone [i.e. ‘impossible’] is defined as being: “impossible to see the crescent from the areas located under the red color because either the moon on this day sets before sunset and/or the topocentric conjunction occurs after sunset”. A quick glance reveals that neither Yemen nor the USA were in the red zone. This type of red zone, I assume, would be labeled a ‘deterministic’ calculation and thus result in some level of actual certainty. However, anything within what may be termed the ‘gray area’ will remain exactly that: a gray area. Will knowing this unify the Muslim community about the start and end of Ramadan? Absolutely not, because there are many more variables involved. Nonetheless, this is a call for people to stop making inaccurate comments alleging that visibility calculations concerning the moon are ‘certain’ and ‘100% accurate’, as is commonly done. Whether or not Brother Mateen, or anyone else, really saw the moon on June 27, 2014 cannot be confirmed with certainty, but it would be unjust of anyone to say he was deluded or high at the time. Notice the major differences between the two maps. See http://aa.usno.navy.mil/faq/docs/crescent.php, last accessed July 6, 2014. Thank you for your thoughtful article. I found it very interesting. Naturally when we want to believe that someone saw the moon, but experienced astronomers tell us it was impossible, we look for even the slightest admitted inaccuracy in their sources so we can dismiss them all together. This is ultimately a dishonest approach. – They don’t have the same amount of bands. One has 4, another 3, another 2. Obviously they are going off of different mathematical thresholds. – The second two include recent outlier data that considers more powerful telescopes. The first has a smaller “visible by telescope” region for that reason. You will notice that they all three have almost identical “visible by naked eye” regions. – The not possible region in the 3rd that you seem to site as proof that anything else is possible, is simply the regions where the moon will set before the sun. If that is your only criteria for not being able to see the moon, then you need to go out moonsighting a whole lot more. Regardless, even if there is some slight variation in the visibility curves, it has no effect on the 2014 sighting report you mention. That sighting was WAY WAY WAY outside of the curves on all 3 anyway. Even still, the curves are not even necessary to see show that it was not the moon that the singer brother sighted. The testimony itself does the job there. He claims to have seen the moon at approx. 8:03. That would be 1 to 3 mins after visible sunset. Anyone who has been moonsighting knows that simply is not possible. The sky still is much too bright to see the very very thin new moon. It takes another 15 sometimes 40 mins for the sky to be dark enough to reveal a thin new moon. Additionally, that moon was less than 19 hours old, making the moon so incredibly thin that it would be extremely difficult to see even in a tremendously dark sky. Additionally (as if more wa s really needed) the moon set was only 14 mins after sunset. Such a 14 minute lag time means the moon was not only gone very quickly but that it was only situated in the absolute brightest part of the sky at the bottom of the sunset for its very few brief minutes. So, I essentially agree with you on one point. Yes, there is too much obsession with the charts. Ultimately, responsible organizations should assess reports based upon the actual testimony. But if they actually are responsible in looking at the reports, they will find that the science of astronomy and our thousands of years of human knowledge of moon movement and visibility is really quick simple and accurate. “But anything is possible with Allah,” some say, desperately trying to rationalize their eager desire to hurry up with the moon sighting. 1. You will never see a 29th day moon 2 mins (even 10 mins) after sunset. 2. You will probably never see a moon under 19 hours old anywhere, anytime. 3. You will never see a moon that is scheduled to set 14 mins after the sunset. If you do actually achieve any of the above. Please post it here. I will check back every few months to see. 2. That same Muslim is chosen by Allah for a miraculous, world-record sighting of the moon that flummoxes astronomers and moon-sighters everywhere and astoundingly defies millennia of precise compiled human knowledge of the movement, location, appearance, and visibility of the new moon. The obvious question is what are people seeing then? There are lots of things they could be seeing. We have a sky that is much busier than the time of the prophet. Here are some examples of things people often mistake for the moon: http://is.gd/geVbsI. Forgive me for the long post. I pray we have more clarity about these issues in the future. The best solution is for people to actually go out and sight the moon more often. Maybe even outside of Ramadan and Shawwal! Then they might better understand how the moon looks and moves, when it can and can’t be seen, and we need not worry so much about charts and these silly debates. The best proof and education is the sight the moon oursevles. It is the sunnah and it is not only an enriching remedy for the intellect, but also for the heart as well. I agree with that blindly using visibility charts to negate sightings in the ‘grey areas’ should be questioned, especially when we move closer to the area where the possibility of sighting increases and for those who live at high altitudes. However, there is no credible science that currently negates the impossibility of naked eye visibility of the new moon beyond the Danjon Limit (7 degrees), which almost all these charts indicate. These visibility charts are not just the product of ‘amateurs’ like Dr. Khalid Shuakat, but based upon science from professional astronomers / scientists / as academics from the likes of HMNO (formerly of the Royal Observatory in Greenwich, UK) who have published a numerous academic papers supporting the science and mathematics to indicate impossibility and increased probability of moon sighting. We have no mainstream astronomical organisations and hardly any academic papers that argue that the Danjon limit doesn’t apply to naked eye sighting. The only way we can see the moon below the Danjon limit is if we use very special equipment such as an infra-red telescope / camera. The key point is that we can use the charts, especially those produced by reputable astronomical organisations to question a sighting where science tells us it is clearly impossible to do so. The issue with sightings within an urban area was addressed by Imam Abu Hanifa. It was his opinion that the sightings must be by Jaam.i.ghaffeer, multitude of people, and not just by one or two. Visibility curves have been proven wrong on many occasions. For one the speed of the earth is not constant. It varies, and the earth also wobbles around it axis. The wobbles cause angular distortions that are not captured by the curves. WS – the above mentioned statement of Imam Abu Haneefah RH is not a daleel but an opinion of Imam Abu Haneefah. As such it is forbidden in Shariah to formulate an opinion on top of another opinion, rather an opinion must be formed on top of an actual Shari daleel. A Shari daleel like a hadith of Rasoul SAW rather than an opinion of a scholar. There is also a variation of this narration from Ibn Abbas: “An Arab came to the Prophet (saw) and said: ‘I saw the Hilaal (of Ramadhaan)’ He (saw) said: ‘Do you bear witness that Laa Ilaaha illa Allah and that Muhammad is His slave and messenger?’ He said ‘Yes’ So The Prophet (saw) said: ‘Get up and announce to the people that we are fasting tomorrow’.” It was narrated by Ibn Khuzaimah (1923) and Ibn Hibbaan, An Nisaa’i, At Tirmidhi and Ibn Abi Shaibah. Al Haakim and Adh Dhahabi verified it as Saheeh. In fact the Hanafi school of thought strongly argues against any other view. This position can be found in the books of many of its scholars and its fiqh manuals. Imam Kasanee in Bada as-Sana’i said that following other than one sighting for the whole Ummah is Bid’a (innovation). This indicates how weak he felt that the other Ijtihad was. Imam al-Juzairi in first volume of Fiqh al Madhahib al Arba’a (The Fiqh of the four schools of thought) gives two views of the Hanafi’s regarding this: 1) The sighting of the moon by any Muslim should be accepted whether slave, free, man or woman without inquiring whether they are just or not, 2) The justness should be verified by a Qadi (judge). Even more contemporary scholars like the founding and well known scholars of the Deobandi and Barelvi movements of the Indian subcontinent have clearly stated this as the correct view in their Fatawa. It is unfortunate that today many who claim to follow them ignore following this hukm. The co-founder of Dar al-Uloom Deoband, Maulana Rasheed Ahmad Gangohi said: “If the people of Calcutta sighted the moon in Friday, whereas it was sighted in Makkah on Thursday itself, but the people of Calcutta did not know of it (the sighting on Thursday); then whenever they come to know of this, it will be obligatory for them to celebrate eid with the people of Makkah and make up (Qada’) for the first fasting.” [Maulana Rasheed Ahmad Gangohi, Sharh Tirmizi (Explanation of Tirmizi), Kaukab un Durri, p. 336 Urdu edition]. “Question: There has been some dispute in Amritsar etc. 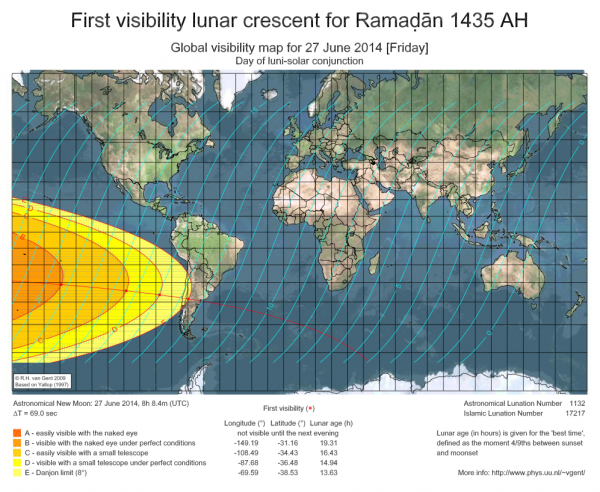 regarding sighting of moon for Ramdhan and Eid ul fitr. So should we the residents of Mandla (CP), which is located very far off, follow that sighting or not? * just a point of clarification on the above point in that I am not saying that you have formed an opinion on top of another opinion but simply highlighting the fact that that is an opinion and not a daleel and as such people should not build an opinion on top of another opinion, Shariah forbids this. Jazak Allahu kahir Mohammed Naseer. Thank you for providing all those superb references. I don’t think anyone knowledgeable argues against the fiqhi validity of the global sighting position. But the question is really how could it actually work. If “the sighting of the west is binding upon the east” then do the scholars at Dar ul Uloom wait for word from moon-sighters in California to determine their dates? Of course not. That would be ridiculously impractical as they are 12 hours “ahead” of California. So by the time they would hear word of sightings in California (around 9:00pm) they would have already finished their breakfast and gone to work. So much for fasting or breaking the fast based on the west. I imagine you are familiar with the international date line (http://www.worldatlas.com/aatlas/infopage/dateline.htm). This critical modern invention seems to go unmentioned in all the quoting of great Hanafi scholars about the preference for global sighting. However, everyone today bases their calendar dates upon its location in the middle of the Pacific Ocean. What would you suggest Tongans and American Samoans do? They are only 500 miles from eachother but Tonga is 24 hours ahead. I guess more directly, I might ask, in your personal practice do you wait for sighting reports from Tahiti to see if you will fast or not fast the next day? I believe some of the scholars addressed this issue of the impracticably spread out matla, by saying that you would take a sighting from anywhere with which you “shared the same night.” This helps make the range smaller, but it still leaves New Yorkers and even West Africans waiting into the next calendar day to hear moon-sighting reports from Tahiti, or Meccans waiting for Arizona. And it further complicates as Meccans would take the Arizona sighting but the people in Dubai would not as they do not “share the same night” as Arizona. This is still untenable and silly. There are many strong, valid, and even preferred opinions in the corpus of Muslim scholarship, that simply are not sensible and practical in our time. Global sighting is one of them. Thank you for writing this article Sh. Mustafa. I have always contended this issue of rejecting based on probability curves, mainly because at the end of the day we are human, our knowledge is limited, we only enter factors that we know (so far) as data into calculating these algorithms and coming up with curves. The more we know the more thins change, and 10-20-30-40 years from now we can look back and these curves and say how mistaken we were because of some new discoveries or science etc. I am not sure how possible it is to back track probability curves? Determine probability curves for a specific day in the past like say the night before a moon sighting by the Prophet(SAW) and sahaaba in say 620s CE (lol) – after we have the exact dates and we would just have to find all the Shabans and Ramadans or any other lunar month with 29 days during that time. From a fiqhi perspective we could shed more light and see the reported sightings of the Prophet (SAW)/Companions and if theoretically these same curves said it was impossible to sight the moon on that night and the Prophet (SAW) accepted these sightings, I would assume this would put the issue to rest. I know this is a very elaborate idea and rests on our ability to back track these curves to a certain date in history. Would love to hear your thoughts. FYI: I actually heard of you from a friend we share – Adam Jamal – who mentioned very good things about you a few years back. I have all your books and have to say they are very practical overall, alHamdulillah. I do new Muslim classes out here in Eau Claire, WI as we have 2-3 shahadas every month and was looking at your book to develop a curriculum in the past, alHamdulillah it helped. In any case this is a good reminder that the use of current visibility curves is not exact. As you noted, there is a pretty wide swath of earth where the two charts posted above do not agree. I personally do not know what criteria our higher-ups are using to determine whether or not to accept a particular sighting but were it me submitting a report from inside the red zone, or beyond, I would want to capture it on camera through a telescope (after finding it via a naked eye sighting). A different question though is, for those of us who prefer an actual sighting, what role (and why) should the use of empirically derived models play when deciding whether to accept the testimony of regular people sighting the moon ? Then again, these days, what normal person goes to look for the moon ! Jazak Allahu khairan for an excellent article. I’m glad that I’m not the only one thinking what you wrote. I agree there there’s enough of a gray area that people should not be so stringent in their views. But I have a question: Did you discuss the visibility curves with their creators, especially the 2nd one (moonsighting.com’s)? Moonsighting.com is a go-to site for a lot of people and Khalid Shaukat’s point of view would’ve been interesting to include. Also, what are your thought’s on Fiqh Council of North America’s astronomical calculation method? The solution is simple. Produce a photo of the crescent from outside the visibility curves and we’ll abandon the astronomers. This is becoming a routine in different parts of world and particularly in Pakistan that they are celebrating 2- Eid-ul-Fitr every year. In North America it is obvious that Moon Sighting Committee is sitting in Toronto or New York needs to announce their verdict within specific time while the sunset is due in about 3 hours in British Columbia or California. This is definitely a difficult situation to arrive on a decision and is the main causing the split Eid. In Pakistan it is mostly in the areas of Kalat in Baluchistan and Mardan in Malakand Division, where it is causing the split decisions. Ignoring the effect of atmospheric refraction, distance to the horizon from an observer close to the Earth’s surface is about 4.7 kilometers for an observer standing on the ground with average height of 1.70 metres. It is 5 kilometers when he climbs 2 meters. For an observer atop Mount Everest (8,848 metres altitude, the horizon is at a distance of 336 kilometres. This is possible that a person may sight a moon in Malakand Division but not in Islamabad or Peshawar owing to his better sighting position obviously due to altitude. All moon sighting maps are based on formulas, which are not catering the altitude and causing this problem. It is necessary to determine the horizon of the country and these meeting must take place at those places from where the possibilities of moon sighting are undeniable. The meetings of moon sighting committees are taking place in the capital cities where the chances of moon sighting are minimal. Yemen is also a mountainous region like Pakistan and need to explore for above conditions. Has this happened in recent history ? Are you aware of any years here in North America where the 3 hour time difference -alone- caused a split Eid ? This Eid UL Fitr was split. Yesterday July 17th was celebrated in California and 18th in Toronto. God bless you for being an equalizing force amongst such varied and aggressive currents. The question arises: although some scholars allowed calculations to deny a moon’s birth, does that take precedence over a person’s adala and dabt. In this case, Br. Mateen is known for his outstanding character and commitment to the truth, do the same assumptions apply to the large number of Muslims who claimed to see the moon that night as well? My understanding is that our assumptions of Muslims, at their base origin, are to be that they are upright and sincere. No doubt, qualifications are a must, but these issues demand another important question: has science, in the name of the tradition, caused us to forget the importance, the value, of a righteous soul? Accusations of being high are humorous, but hurtful and, even in jest, rejected by the jurists. I look forward to seeing you this week, beloved. Very good reminder. I was taught by some of my shuyukh that rejecting sightings through science is not so much about questioning the person’s integrity as it is questioning their ability to understand what they are seeing in the sky. That made sense to me at the time since we as a supposedly advanced generation have lost touch with nature. The average educated person with a fancy degree cannot even identify the north star, let alone any other celestial bodies, even though an ignorant Bedouin child in the past would be able to do so. Nonetheless, the question about whether a visibility curve represents ‘yaqin’ or not is in question. Had the moon set in a region when a person claimed a sighting, then this issue would be a valid one, but that is not the case when it comes to these maps. Let me know where you are at, I would love to meet up.